ALBANY, N.Y. The National Rifle Association said the secretive negotiations and lightning-fast passage of New York's tough new gun control laws squelched the powerful gun lobby's ability to mount opposition. Gov. Andrew Cuomo said he had to engineer quick enactment to prevent a counterproductive buying spree of now-outlawed guns. The legislation was negotiated over the weekend, introduced on the first day of the 2013 legislative session and signed into law the next day. The NRA, which has thwarted such restrictions nationwide, had members working the phones but didn't have enough time to coordinate a public rally. The gun-rights group and some New York lawmakers say the rushed legislation also undermined public input and meaningful debate. "They did slide this through in the middle of the night," said Tom King, president of the New York Rifle & Pistol Association, the state's NRA affiliate. "There was no negotiation with any pro-gun group. Up until 10 o'clock in the evening of the day of the vote, they were telling me there was no agreement." The group annually sponsors "Sportsmen's Day" where hundreds of hunters and other gun owners crowd statehouse hallways to urge their legislators to support gun rights. There was no chance to mount a similar event this week, since it would require a designated Capitol space, permits, legislative sponsorship and arranging for buses and city parking fees, King said. "It takes longer than two days to do that," he said. King said his group asked members to call legislators ahead of the legislative session when they knew it would be coming up as an issue. "We urged our members to call rather than email. It's awful easy to delete emails, but you have to answer the phone," King said. "That's something we do any time there's any kind of threat to Second Amendment rights." Does Obama's gun control plan have a chance? Cuomo and legislative leaders negotiated the bill's language behind closed doors, a regular occurrence in Albany. The bill was introduced on Monday evening, passed the Senate on Monday night and approved by the Assembly on Tuesday. 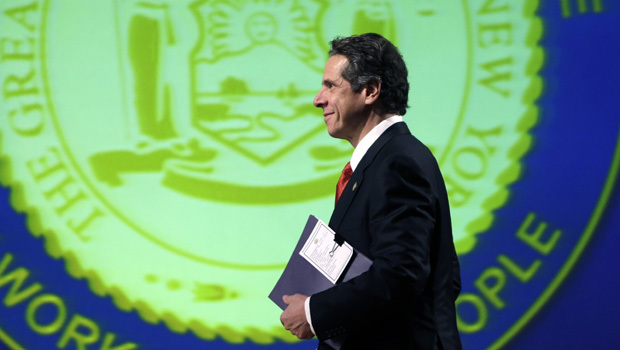 Cuomo, who issued a special waiver to avoid the usual three-day window for lawmakers and the public to review bills, signed it into law late Tuesday afternoon. Cuomo said in a radio interview Thursday that the one-day buying spree at gun stores would have turned into three if he hadn't asked lawmakers to shortcut the usual waiting period for acting on new legislation. He said polling shows most New Yorkers favor tighter gun restrictions. A Siena College poll released Thursday showed 73 percent of the state's voters want the toughest assault weapon and magazine restrictions in the U.S. The new law reduces the maximum legal magazine size from 10 bullets to seven. It redefines assault weapons to include semiautomatic rifles with detachable magazines that have one military-style feature such as a pistol grip, flash suppressor or bayonet mount, instead of two. Owners of an estimated 1 million formerly legal guns can keep them but are required to register them with state police within a year. The legislation was not a complete surprise to New York's estimated 4.75 million gun owners. Cuomo had promised tighter gun laws following the December slayings of 20 children and six educators at a Connecticut elementary school. Authorities said the gunman used a military-style semiautomatic rifle and 30-round magazines. Cuomo said Thursday that gun control is a 30-year-old debate, and many bills were introduced previously. Legislators haven't wanted to offend some people on an issue they feel passionate about, and the Newtown, Conn., shootings were a catalyst. "Reforms often come from incidents that occur. That's in history," Cuomo said. "The public is living their lives, then there's an incident. They focus. They have an opinion, and the politicians often follow the people." The legislation passed New York's Senate 43-18, with opposition votes coming from Republicans across the upstate region. The bill passed the heavily Democratic Assembly 104-43. Lawmakers from New York City, which has even tighter gun restrictions, and from its Long Island suburbs nearly all voted for it, including 10 Republican senators who joined 32 Democrats to pass the bill. An 11th Republican, Mark Grisanti from Buffalo, also voted for it. Freshman Assemblyman Kieran Lalor, a Hudson Valley Republican who voted against the bill, said his office heard from maybe 300 constituents within a day after the law was signed, with only two in favor. "I'm surprised that it is so overwhelmingly opposed," said Lalor, an attorney and ex-Marine, acknowledging his largely suburban and rural district is probably politically center-right. He said he barely had time to read the 40-page legislation twice before voting, adding there was no time to absorb all its provisions and that some, like registering 1 million formerly legal guns, may prove unworkable. The NRA warned it would "speak frankly" about the legislators who voted for the bill. King said Thursday that they'll be looking at legislators' votes as they prepare for the 2014 state elections, but it's too early to make a decision about that and there's still a long legislative session to go.